Not a lot of U of S classes have “properties and theories of explosives” listed in the syllabus. In fact, the only one might be Donna Beneteau’s fourth-year geological engineering class on drilling, blasting and excavation. Beneteau, a geological engineer with extensive experience in the private sector, learned about blasting on the job. 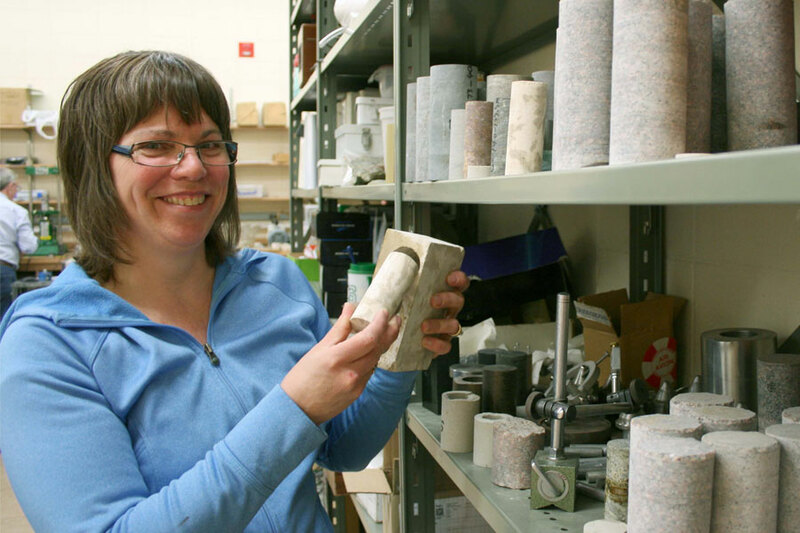 She came to the U of S in 2011 to work as a research engineer in the rock mechanics lab, located in the basement of the Geology Building. Last year, she started teaching the drill, blast and excavate course to an eager classroom of would-be engineers. The course is part of the mining option soon to be available for geological engineers (other mining options will be available in the chemical and mechanical engineering programs). During the course design phase, the College of Engineering consulted with industry stakeholders to determine their needs on the recruitment side. Beneteau recalled one such meeting held with representatives from Saskatchewan mining companies for input. "I think there were eight or nine mining companies," she said. "They sent their technical people. We met in a classroom and said, ‘So what do you want us to teach?'" That input is evident in the title. Th e class was originally going be just drilling and blasting, but given the role and mining methods of potash and uranium in the province, excavation was added to the course as well. "I think industry's the best teacher," said Beneteau, adding that besides the classroom and lab work component, the class also plays host to guest lecturers from the mining industry. But the most exciting aspect of the course, hands down, is the daylong rock-blasting lab held near the end of the term. Th e class members travel to a rock quarry just outside of Saskatoon and are given demonstrations of various blasting methods and techniques covered in class. "It's one of those things you have to experience," she said, "that you would never be able to explain in a classroom just by looking at pictures." Joining them is Leonard Banga, owner of Xtreme Mining and Demolition in Saskatoon who has more than 20 years' experience blasting in Canadian potash, base metal and gold mines. In the six-hour-long blasting lab, tubes of explosives are put into holes drilled in rocks. Besides just blowing things up, the students learn the proper safety techniques for handling explosive materials (such as emulsions and ammonium nitrate/fuel oil) and how to create time delays that are more eff ective at blasting larger rocks, a technique widely used in the mining industry. They are taught to assess the type of rock they are blasting as well as its condition, because each reacts diff erently. Beneteau recalled a day in the fi eld when Banga loaded a hole that had been drilled into one large piece of concrete ("about the size of a desk," she said) with the intent to blast a small section of it. However, one minor explosion turned the entire block into a pile of gravel. "Even a blaster has to learn environmental conditions," she said. "The rock could be fractured or wet, and it aff ects how it goes off ." She added that despite one unexpected misfi re, the class has been a huge hit with students. "At the end of the last field day, one of the students said as they were leaving, ‘That was my best day of school ever.'"